Hold the perfect party at The Rink, for 2 hours on ice with our exclusive Party Package. 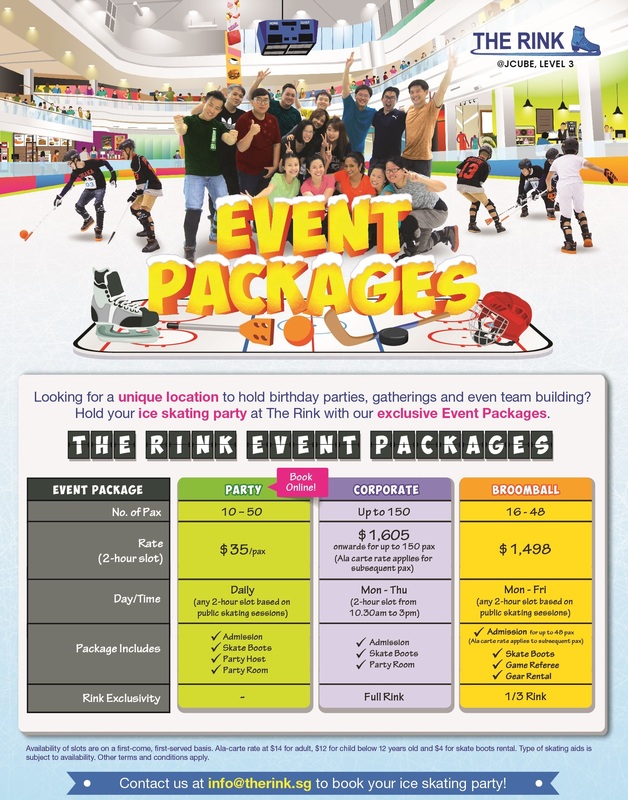 Have tons of fun on ice for your special celebration and it will definitely be an unforgettable experience! Admission, skate boots rental, usage of party room and a dedicated party host. Choose a 2-hour time slot from our Public Skating Sessions page, and book your party through our online portal now! This package is available daily for all sessions, subject to availability. Note that The Rink will not be fully closed for the Party Package. To book the whole rink exclusively, do visit Corporate Bookings. A minimum of 10 skaters are required to book the package. A minimum deposit of $350 must be made through the online portal to confirm your booking. – 30-minute party host on ice, who will provide beginners with guidance on basic ice skating. Catering is not included in the package rate. Guests are free to set up their own catering at the party room. Food must be served within the first hour of the session to ensure that the party can finish promptly. Alcohol is strictly prohibited in the premises. A kid guest may be accompanied by a maximum of one non-skating parent or guardian, free of charge. This parent or guardian has free access to the party room and the viewing gallery, but not on the ice. Users are to hold their party booking during the stipulated time period. Room may not be sublet to another user. Users have no rights of tenancy or any other agreement other than these conditions. Users must report all accidents/ incidents at the time of incident to the facility operator on duty. Users are liable and responsible for any damage caused to the facility by the guests of the organization. Users must conform to all prevailing by-laws and policies under Singapore law, including but not limited to unruly and/or disruptive behavior, alcohol and smoking. No sale of food or drinks (including beer or liquor) is allowed. Host your corporate parties with us for an eventful 2 hours on ice, and bond with your colleagues through ice skating. End the party with a game of Broomball on Ice, for the ultimate office party. Create fun-filled memories of ice-skating and bonding with The Rink! 50% surcharge during School Holidays. Not available on the eve of and during Public Holidays, contact us for availability of time slots and rates. Users are to rent the function room during the stipulated time period as set out on the booking request form. Room may not be sublet to another user. All bookings must be paid by cheque at least 14 working days before the date of usage. Booking can only be confirmed upon receipt of payment and completed booking form. Broomball is a unique sport that is as thrilling as ice hockey, but no skating skills are required as it replaces ice skates with special rubber-soled shoes that allows you to walk on ice. Broomball is great fun for the friends and family, for an exciting time on ice, look no further than Broomball! All bookings must be paid at least 14 working days before the date of usage. Booking can only be confirmed upon receipt of payment and completed booking form. Bookings will be accepted on a first-come, first-serve basis and subject to availability. Users are liable and responsible for any damage caused to the facility by guests of the organization.